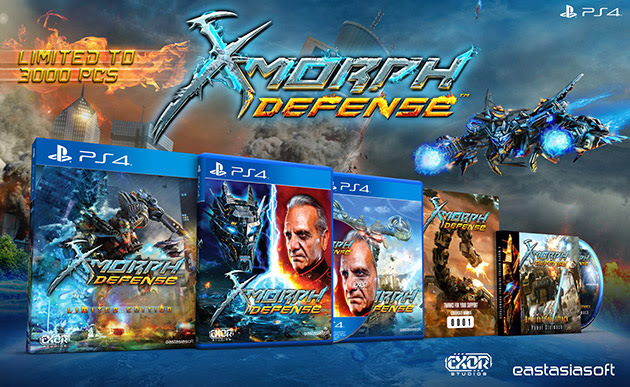 Eastasiasoft teamed with EXOR Studios to release a worldwide exclusive PS4 Limited Edition of their shoot'em up / tower defense cross-over X-Morph: Defense in Q2/2018. Our physical release will include the European Assault DLC and all the latest updates on disc. The Limited Edition box set includes game disc (region free / reversible cover), soundtrack CD, numbered certificate and collector's box. The game will be limited to 3000 pcs and sold exclusively at online retailer Play-Asia.com. More pre-order campaign details will be announced soon.